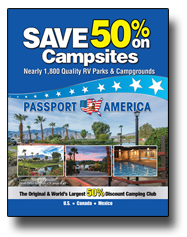 Do you need a copy of the Passport America International Camping Directory as a back-up when you do not have internet connection? Or do you need one for the RV and one for the house? Members can acquire as many copies as they need and pay only for shipping and handling. Purchase your copy today and we will mail it the next business day. If you are a Lifetime Passport America Member, please either email or call our office to request your copy. Not a member? Please click here to join online. When you join or renew you are given the option to choose "printed directory" at the time of payment. Shipping and Handling: US Addresses: Standard Mail (2 - 3 Weeks) $5, Priority Mail (3-5 Business Days) $8 and Express (1-2 Business Days) $25. Canadian Addresses: Global Priority Mail (10-14 Business Days) $26. All other countries - $35.00. Shipping address is the same as the billing address.